In the earth's geologic history, the Galápagos Islands are about twoscore specks of volcanic rock in the Pacific Ocean, straddling the equator some 600 miles west of Ecuador. In the history of human thought, however, they represent one of the great watersheds in science and philosophy, if for no other reason than their having been visited in 1835 by a twenty- six-year-old British naturalist named Charles Darwin. Darwin observed the islands' uniquely diverse, yet clearly interrelated animals and plants (especially the giant tortoises, iguanas, and finches) and used those observations in building his epoch-making theory of evolution. Before Darwin's visit, those who speculated about man's origins and place in the world groped for a coherent organizing principle; after it they would be equipped, however imperfectly, with the concept and theory of adaptation and evolution by means of natural selection -- a theory of such intellectual power that it still guides students of life a century and a half later. Throughout the voyage of the Beagle Darwin suffered horribly and more or less continuously from seasickness. Nevertheless he proved himself to be a tireless, sensitive and observant naturalist. 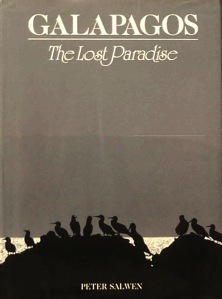 He not only recorded and described every species he could lay hands on; he measured, weighed, compared, and experimented, examining the feet and guts of land and sea birds, for instance, to learn exactly how different sorts of seeds and spores might have been carried to the islands. He rode on a tortoise and noted its precise speed (360 yards an hour). More importantly, he thought deeply about what he saw, for he recognized that it was not only the strangeness of the animals that was worthy of notice, but the obvious family relationships among the various species and subspecies. His speculations, transmuted after another quarter-century of reflection and further study emerged to shake the foundations of scientific thought in Darwin's 1859 masterwork, The Origin of Species by Means of natural Selection: Or the Preservation of Favored Races in the Struggle for Life. A long line of voyagers have had little good to report of the Galápagos, beginning with their first European discoverer, the Dominican friar Tomás de Berlanga, Bishop of Panama. "I do not think there is a place where one might sow a bushel of corn, because most of it is full of very big stones, so much so, that it seems as though sometime God had showered stones; and the earth there is dross, worthless, because it has not the power of raising a little grass." In 1709, Robinson Crusoe--or rather, his real-life model, the Scottish castaway Alexander Selkirk--paid a visit with his rescuer, the buccaneer captain Woodes Rogers. Later callers included "Foul-Weather Jack" Byron, grandfather of the poet, and Captain Amasa Delano, a maternal ancestor of Franklin Delano Roosevelt. The first full-time Galápagos resident was a disagreeable Irish sailor named Patrick Watkins, who had been put ashore on Charles Island. Living in a sort of cave scraped out of the lava, he somehow contrived to grow a crop of potatoes and tobacco, which he traded for rum when whalers came a-calling. 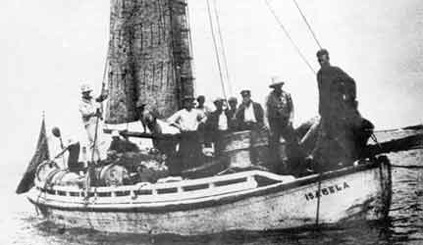 A fearsome, "beast-like," half-wild creature with wild red locks and beard, Watkins captured stray sailors, holding them until he had amassed a crew capable of carrying him back to the mainland in a stolen boat. 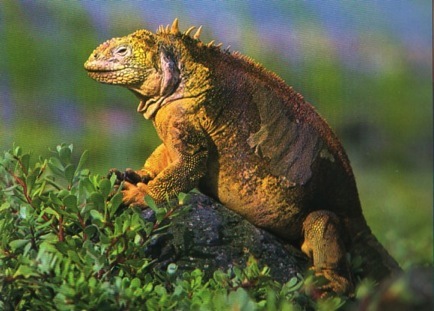 In the 1920s an unscrupulous Oslo promoter named Harry Randall flooded Norway with promotional literature touting the Galápagos as having "soil so rich that 100,000 people could easily find homes" and "thousands of trees of every type which bear fruit the whole year around." He succeeded in conning over a hundred of his countrymen, at six thousand kroner a couple, into shipping out for the islands. Of the first 22 settlers, all but four were gone within six months, twelve of them dying in Guayaquil. Still, they kept coming, another hundred or so over the next two years. Some of them tried to set up a fish cannery, others a coffee plantation and a sugar refinery. Within three years the cannery was gone (boiler explosion) and so were most of the Norwegians. By then, the islands had become, in Victor W. von Hagen's felicitous phrase, "part of a millionaire's grand tour." William Kissam Vanderbilt, Vincent Astor, and a whole parade of wealthy yachtsmen made it their business to drop anchor off Post Office Bay and bring back tales (and, too often, specimens) of the local wildlife. Gifford Pinchot, founder of the U.S. Forest Service, was particularly delighted when a land iguana actually crawled up into his lap to feed on a proffered grasshopper. From then on, Pinchot insisted on referring to the creatures as "Lap Dragons." In the woods there are many wild pigs and goats; but the staple article of animal food is supplied by the tortoises. The people count on two days' hunting giving them food for the rest of the week. It is said that formerly single vessels have taken away as many as seven hundred, and that the ship's company of a frigate some years since brought down in one day two hundred tortoises to the beach. These depredations literally emptied some islands of their tortoises, and brought the tortoise populations of several others to the brink of extinction. Meeting the tortoises is an awesome experience. With their ponderous movements, great wrinkled necks, the ancient-looking beaks and dark-ringed, tearing eyes, these antediluvean beasts arouse an unaccountable sense of awe and pity. They look so ancient, you could imagine that the individual in front of you had personally witnessed the predations of the buccaneers and whalers, watched his fellows carried off by the tens of thousands. Almost every visitor to the Galápagos expresses astonishment at the extreme tameness of the birds, but the mockingbirds are undoubtedly the boldest of all. Darwin told of lifting a pitcher while a mockingbird, perched on the rim, drank from it calmly. Ornithologist Bryan Nelson found the Hood Island mockers particularly brazen: "If we averted our eyes from, much less turned our backs on the breakfast table, they jumped up and gobbled the butter, laying their slim beaks sideways to get bigger mouthfuls. Often a tug at the hand alerted us to the forty thieves stealing butter from our bread." The endearing, clumsy-looking boobies (their name is said to be a corruption of the Spanish bobo, "clown") are a tourist favorite, right up there with the tortoises. They fish in small groups, plunging from a height of 50-80 feet into the coastal shallows in a screaming 45-degree power-dive and emerging with a fish caught in the open bill on the way to the surface. They breed throughout the year, so we got to see many of the typical behaviors of courting and nesting couples: parading, jabbing, "sky-pointing" with outstretched, curved wings, and -- most startling of all--incubating an egg by embracing it in the webs of those amazing blue feet. Española's jagged southern shore is eroded by waves into narrow clefts. One of these, near Punta Suarez, forms an inverted funnel, where the surf collects and is forced into a dramatic blowhole. Even on a quiet day the spume hisses thirty or forty feet upward. The island supports a good variety of animal species: the beaches, curving eastward in a dreamy arc, are colonized by sea lions, long-billed mockingbirds, Galápagos doves, short- eared owls, oyster-catchers and swallow-tailed gulls. Boobies nest on a broad ledge above Punta Suarez, and the area is home to a unique tortoise species with an elegantly curved, bulbous shell. If you could visit just one island, you might want it to be gem-like South Plaza. 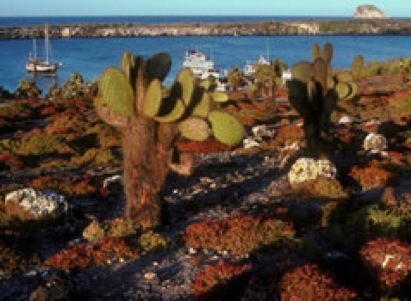 Tiny and delightful, it offers an astonishing diversity literally at arm's length: a sea lion harem on the beach, complete with nursing pups, and land iguanas browsing like ruminative dinosaurs at the foot of an Opuntia grove. The cliffs, lit by the slanting late-afternoon sun, were densely crowded with graceful swallowtail gulls, boobies (and their enemies the frigate-birds) petrels, shearwaters, and a handful of red-billed tropicbirds. The abrupt tropical dusk descended as we waited for the tenders, casting the blunt Opuntia tree-cacti into eerie silhouette, the dark silence broken only by the plash of waves and soft cries of sea lion mothers and pups. 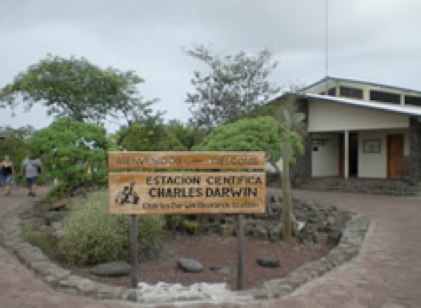 Since Darwin's day, the Galápagos have been a cynosure for naturalists from around the world. They come to study nearly every aspect of nature, since the archipelago has something unique to offer in every department: geology, climatology, ichthyology, ornithology, herpetology, plant systematics, evolutionary studies, ethology and more. 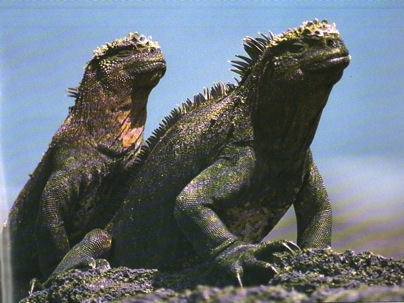 Over three dozen major and scores of minor expeditions have focused on the Galápagos, and the bibliography of resulting scientific papers by now numbers in the thousands. On the purely commercial level, the Galápagos are valued for their remoteness and the exotic life forms that make them a fascinating tourist destination. The same qualities make them a priceless resource for science as well. But on what might be called a philosophical or spiritual level, they have another value. The archipelago remains one of the few unaltered ecosystems in the world, and the world needs to have such places. 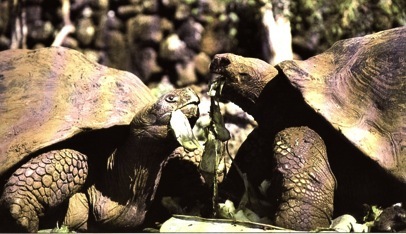 Or perhaps it is simply that we need to preserve the Galápagos as an act of faith. A hundred fifty-four years ago, the Galápagos helped Charles Darwin find the key to evolution, and thereby became a symbol of our intellectual mastery of nature. In our time, the Islands are destined to become a new symbol: either of our continued heedless plunder of the planet; or, if we are lucky, of our growing determination to coexist in harmony with the natural world. published by Bantam-Doubleday-Dell and illustrated with more than 300 spectacular color photos. To date, more than 120,000 copies have been sold in English, Spanish, Italian, and German editions.